The Beach House provides the public a rare opportunity to enjoy a quintessential Southern California beach experience, combining elements of the historic Marion Davies estate with new amenities to create a truly unique community destination. The Annenberg Foundation and the City of Santa Monica worked with Frederick Fisher Partners, Architects; Charles Pankow Builders; Historic Resources Group; Mia Lehrer & Associates; AdamsMorioka; and Roy McMakin to form the new Beach House. I remember having great days as a girl at the beach when it was the Sand & Sea Club, I'm delighted that families from all walks of life will be able to enjoy our beautiful coast and make their own fond memories. At the direction of Wallis Annenberg, the Annenberg Foundation provided major funding for the restoration and repurposing of a five-acre beachfront property at 415 Pacific Coast Highway, in Santa Monica, California. 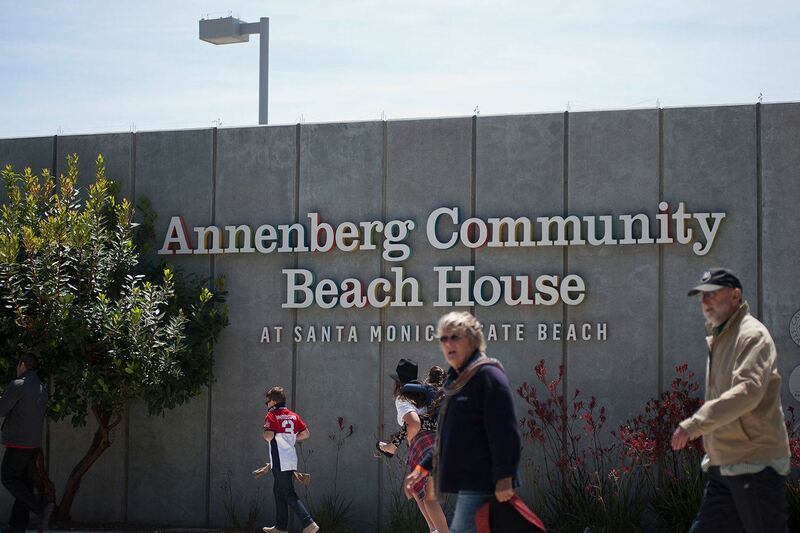 The Annenberg Community Beach House opened on April 25, 2009, and provides public access to a beautiful, multifaceted facility offering swimming (both pool and ocean), volleyball and beach tennis courts, children’s play areas, event and meeting spaces, classes and other recreational opportunities. Originally developed in the 1930’s by William Randolph Hearst for actress Marion Davies, the property was the site of an elegant 110-room mansion designed by architect Julia Morgan. The estate hosted a wide range of stars, including Charlie Chaplin, Clark Gable, Cary Grant and Gloria Swanson. The estate was sold in 1945 and the property was run as a hotel. After that venture failed, the mansion was demolished and the property sold to the State of California in 1959. For the next 30 years, the site was a popular private beach facility called the Sand & Sea Club, a place Wallis Annenberg remembers visiting in her youth. In 2004, Wallis Annenberg learned about the project and its broad-based potential community benefit. Her interest and generosity, in the form of a $27.5 million grant, paved the way for the site’s rehabilitation and reuse. The project is a partnership with California State Parks and the City of Santa Monica. Activities and classes at the Community Beach House include beach volleyball, yoga, stand-up paddle board rentals, surfing instructions, and beach culture events. The project includes restoration of the historic pool and guest house (the only structures that remain from the original house) and construction of new structures including an entry pavilion, pool house, event building and public restroom building. The facilities were thoughtfully rehabilitated and designed by Frederick Fisher and Partners, Architects. Beach: Commemorating the 5th anniversary of the Annenberg Community Beach House.